This week’s Woman in Progress is a shot of pure sugar-filled joy, Vicky Graham of Vicky’s Donuts. 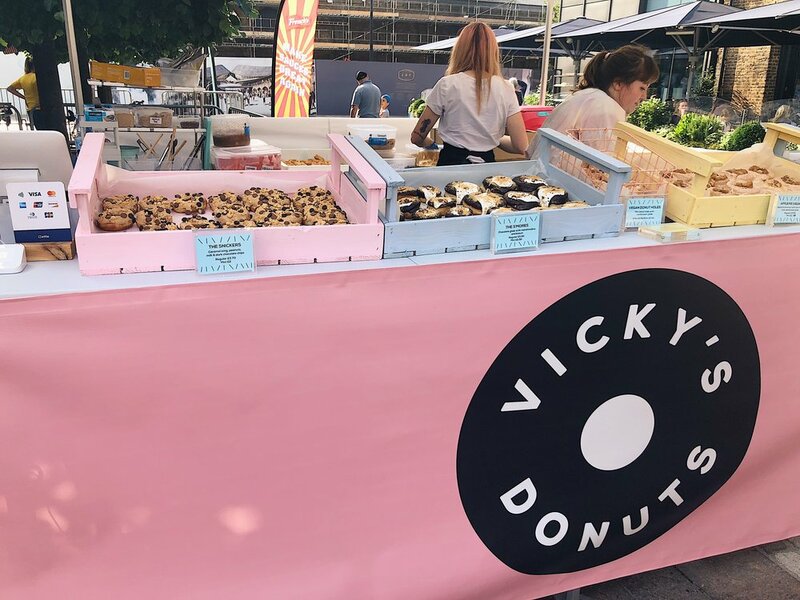 I met Vicky in my sweet-making days, when she was my neighbour at a BBC Good Food Show where she sold out every day in just a couple of hours - it was clear then that her delicious donuts were going to prove massively popular - and they really have. 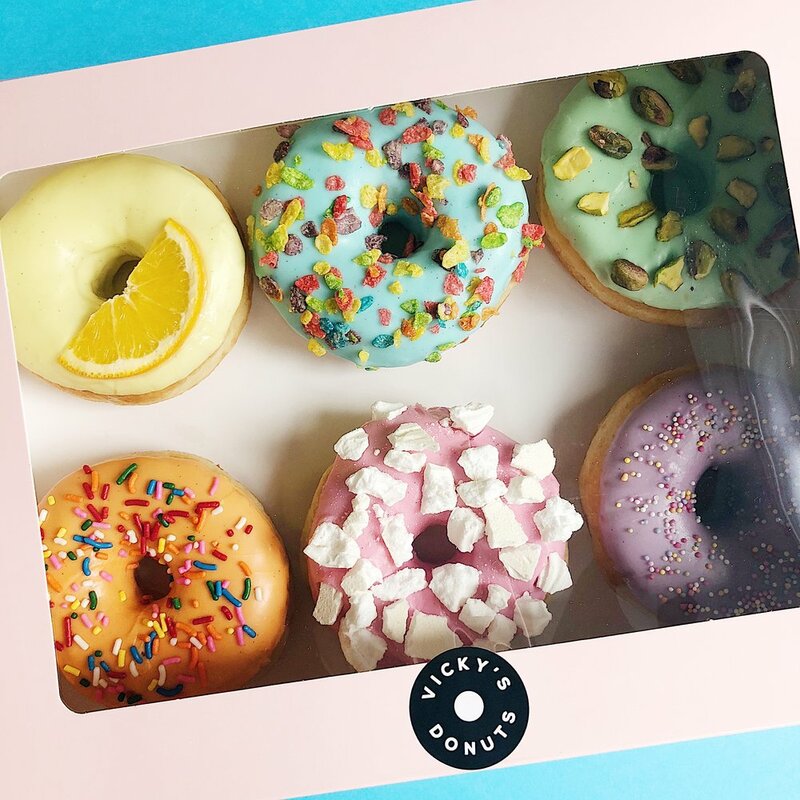 Vicky’s Donuts were rated ‘best taste’ donuts by Time Out, have appeared on a episode of The Apprentice, she’s written a cookbook so you can make your own Ds, and she’s even made dino and whale donuts for The Natural History Museum. We’re thrilled she’s agreed to answer our questions this week. Hai! I’m Vicky. I started up Vicky’s Donuts back in 2015 when I noticed a gap in the London market for American-style donuts made using good ingredients. I have family that lived in Toronto, where donuts run like water, and being around that as a kid made them a really exciting treat and something that became nostalgic to me as I got older. I got into cooking and baking in my early twenties and one day decided to give donuts a go. I was instantly hooked! There’s something quite therapeutic about spending time to make them properly (like with any bread dough) and also with deep frying them - watching them turn into crispy golden rings as they’re dipped into the oil, and being ready to eat within seconds - they’re unlike anything else. And the smell! The aroma of hot donuts is still my favourite thing in the world. Before I started the business, in my early and mid twenties, I had loads of random jobs. I worked for Apple - originally selling macs in their Brighton store and then working my way up to work in their corporate office in HR, worked at the National Theatre in recruitment, helped out at a small children’s book publisher in marketing, was a PA to a CEO of a publishing house and then worked in marketing for a food magazine. I remember being quite stressed out in my twenties, not wanting to decide on any one thing but also realising I should probably try and make a “career” for myself, but looking back now, every job I had has taught me something - whether its about myself and what I’m good (and bad) at or about the kind of company I want to work for which ultimately (cue airy-fairy music) has led me to carve out exactly what I want Vicky’s Donuts to be. What’s the one thing in your life that makes things easier? Business apps and software! I used to do things like accounting, scheduling and payroll manually which took up so much time. I also hated doing each one and so would leave them all at the bottom of my to-do list which wasn’t very productive. Now, we pretty much use apps for everything and not only does it save so much time, it’s also more accurate, more transparent for the team and also leaves less room for human error. My favourite ones are Deputy for scheduling and payroll and Slack for internal comms. What’s the one thing you couldn’t live without? Kind of a curve ball but I’m addicted to squash. Not butternut, I wish I meant butternut. Like sugar-y, full of aspartame Robinsons squash. I’ve tried to teach myself to drink naked water but it just tastes like the inside of your mouth. I even take a bottle with me to places if I know they won’t have it - I think that qualifies me as needing help. What do you love to do for fun? I love exploring - whether just around London or going away to new places. An ideal day off would probs involve an extravagant breakfast, wandering around somewhere new and ending up in a place for dinner I’ve never heard of before (that ideally would serve frozen margaritas too). I’ve also recently got into drawing. I did an illustration short course at Central St Martins at the beginning of the year and it was amazing! I’m not the best at drawing but find it really therapeutic and love incorporating it into work too. I’ve just finished making some screen prints of a cute donut recipe illustration and want to make some gift cards we can include with our donut boxes next. What one piece of advice would you give yourself 5 years ago? Try not to worry so much about what people think of you. I spent a lot of my mid-twenties trying to please other people without stopping to think about what I really wanted - both in my personal life and work life. It held me back from taking risks and pursuing things that were out of my comfort zone - I think I thought if I landed a fun job at a cool company and had a nice flat in a trendy part of London I’d be safe from criticism, but actually my heart wasn’t really in any of the decisions I was making and it made me kind of miserable. I’d say I definitely don’t worry as much anymore - I think everyone naturally gets more self-confident as they get older. Very specifically, I remember turning 27 and feeling like it was now or never to change it up (there’s nothing like nearing 30 to give you the kick you need, right?) and just thought f*ck it, I’m going to do what the hell I want and worry about it later. That’s when I started Vicky’s Donuts! I’d just broken up with a boyfriend I’d had for 5 years and my employer at the magazine was starting to make people redundant (and eventually made me redundant 4 months later) so I guess I saw it all as a chance to break free and start something brand new that I was passionate about and I kind of knew there was no room in that for worrying about what people might think. My team! Each one of them is a gem and I’m really lucky to have them. They all care about the business and the part they play and as a result, they help the business grow. They’re also super fun to be around and all-round good eggs and it makes me very happy that they want to work for me. What’s the best lesson you’ve learned at work? Communication is the most valuable resource you have. A business can only operate effectively if its utilised properly. Feedback is super important - both with staff and customers, whether good or bad. It’s what makes you grow both personally and as a business. What’s the best lesson you’ve learned at home? When you’re at home, you’re at home - you don’t check emails or catch up on admin. I have to admit I do break this rule for things I enjoy doing - like thinking up new recipe ideas or playing around with new website designs because they feel more like hobbies that happen to be my job. But everything else I would never choose to do outside of work, I wait until I’m back in. Sometimes I just want to get things off my to-do list but when you spend your days off doing things you don’t want to do, it can really drain you and make you resent your job. When I first started out, I did all of the baking in my flat and it slowly drove me crazy. I had a whole market stall stored in my living room, things like signs and fold-down tables under my sofa and used to find flour and edible glitter on my bedroom windowsills (it’s crazy how far they both travel). 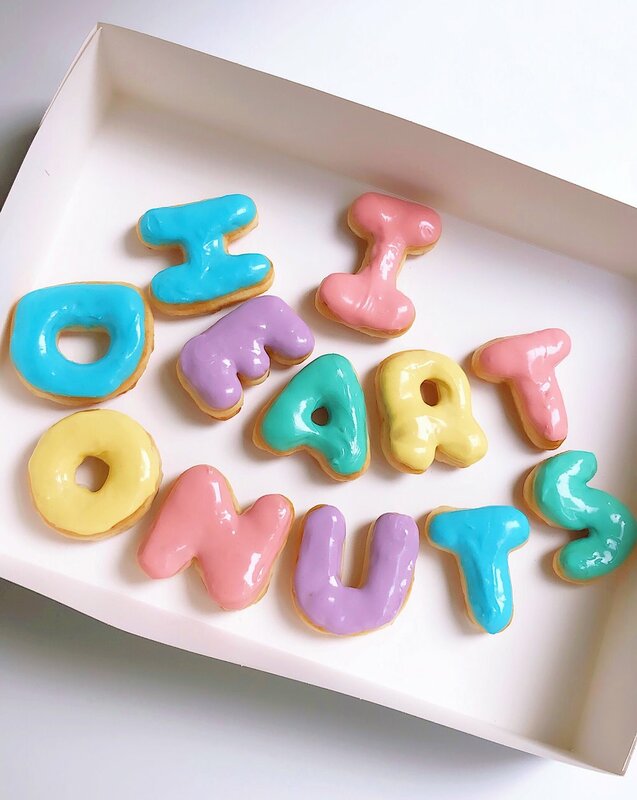 Whenever I was at home, I always felt like I should be working because it’s where everything donut-related happened and it ended up getting exhausting - and then I’d get angry with myself for not being able to relax. So since then I’ve found I’m much happier keeping a clear distinction between work and home and am now lucky enough to have both in two separate places. Did you expect to be doing what you’re doing right now? I always wanted to have my own business one day because I loved the idea of being my own boss and I really enjoy being out of my depth and having lots of different things going on at the same time (that’s a bit weird isn’t it?) but I had no idea how that would manifest itself and certainly didn’t think it’d be donut related, no. What top tip would you pass on to other women in progress reading this? Choose something you’re passionate about - when the days are long and all you want to do is sleep, you have to care about what it is you’re doing or you’ll never get yourself out of bed. Work out your USP and nail it - do lots of market research and carve out an answer to something you notice is missing. Then practice making it over and over again until it’s the best it can be. Save up some money before you start - cashflow can be a problem for any business, especially at the beginning and apparently lack of money in the bank is the biggest cause of most start-ups going bust. You may need to invest in equipment, staff or new premises and all of those things can be pricey so make sure you have enough to cover it in case anything unexpected happens, like big companies taking months to pay big invoices or having to replace a piece of equipment that you rely on when it breaks. Coffee. Black, no sugar. Or in an espresso martini. Is that cheating? Are you done yet? What’s next? Haha I sometimes feel like we’ve pretty much done everything we can, but then another opportunity comes up and we end up totally out of our depth again asking each other how we got here. But that’s the way I like it and I really hope it doesn’t change too soon! There’s a couple of very exciting things happening in the next few months that I’m not allowed to go into detail about but will mean our donuts will be a lot more accessible (at the moment we’re just selling online and at the odd pop-up or market). I also want to focus more on teaching people how to make donuts at home. 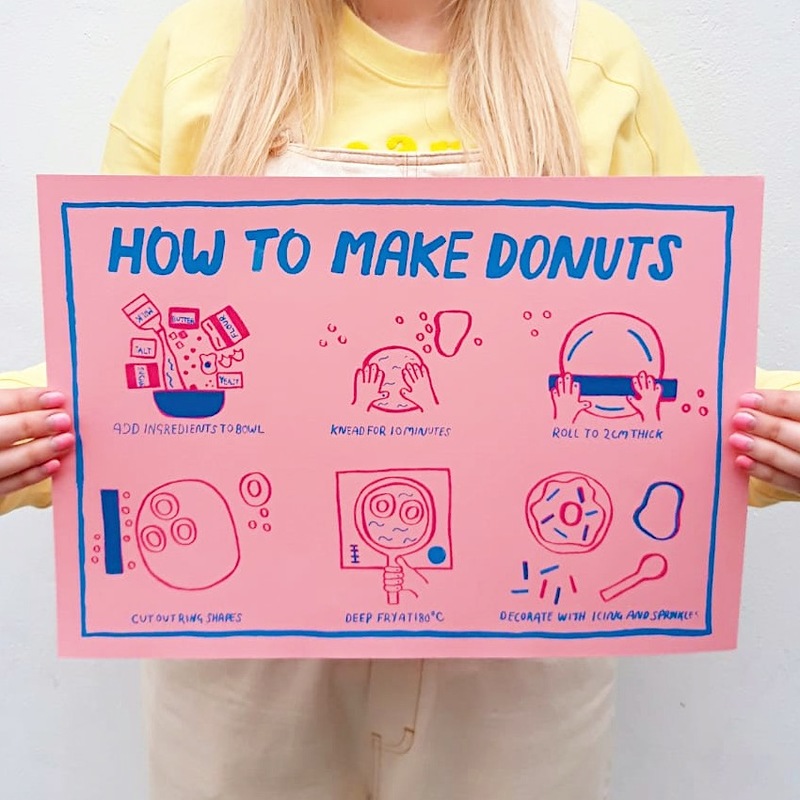 I have a donut recipe book out and get a lot of requests for workshops and have even had people flying in to London especially to come and learn about how to make the perfect donut. I feel like there’s a big audience out there that would love to learn more about how they’re made, whether that means video tutorials on Instagram, online courses, I don’t know but it’s definitely something I want to explore more. Thanks so much Vicky for being our Woman in Progress this week. 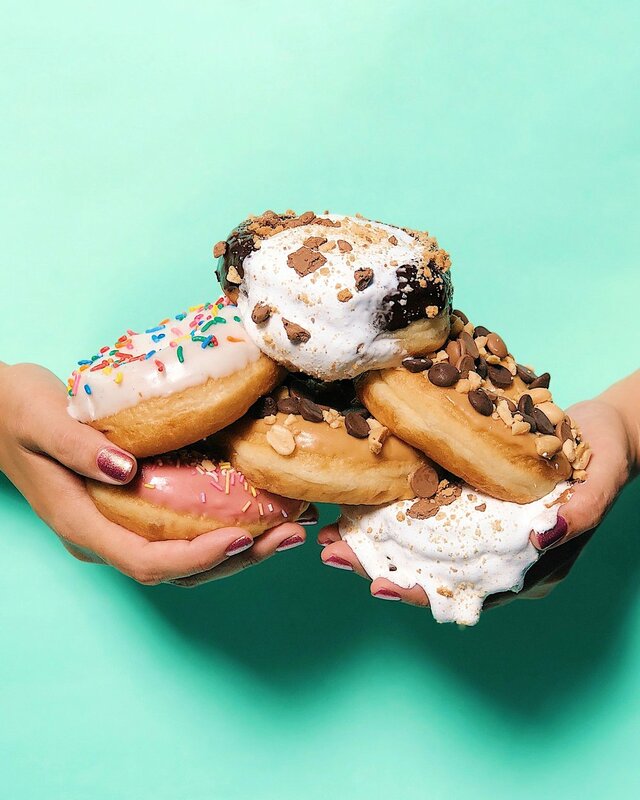 Do check out Vicky’s Instagram for Donut inspiration - and you can order Donuts online so you must also do that immediately! She’s also on Facebook and Twitter if you’re that way inclined. Go get those Ds!